This post is a description of my implementation of Jan Aerts' LocusTree algorithm (I want to thank Jan, our discussion and his comments were as great source of inspiration) based on BerkeleyDB-JE, a Key/Value datastore. 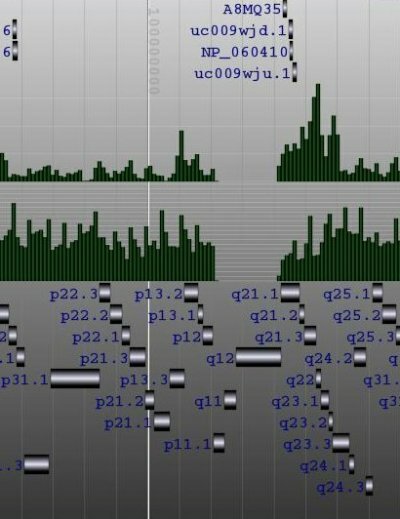 This implementation has been used to build a genome browser displaying its data with the SVG format. In brief: splicing each chromosome using a dichotomic approach allows to quickly find all the features in a given genomic region for a given resolution. A count of the total number of objects in the descent of each child node is used to produce a histogram of the number of objects smaller than the given resolution. Your browser does not support the <CANVAS> element ! All the information is stored in BerkeleyDB and I've used JSON to add some metadata about each object. The JSON is serialized, gzipped and stored in BerkeleyDB. Each organism is defined by an ID and a Name. The Key of the BerkeleyDB is the organism.id. Each chromosome is defined by an ID, a Name, its length and its organism-ID. The Key in berkeleyDB is the chromosome ID. Each track is defined by an ID and a Name. 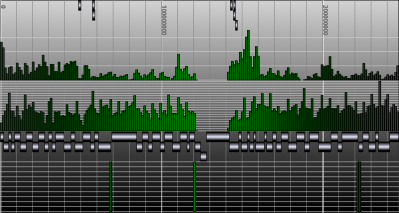 The Key in berkeleyDB is the track ID. 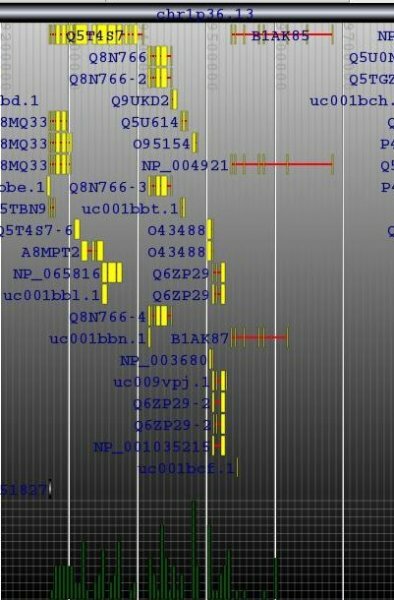 Each LocusTree Node (LTNode) is linked to a Chromosome and a Track using a database named 'TrackChrom'. Here the Key of the BerkeleyDB is a composite key (chromosome/track). The structure of a LTNode is described below. Each node contains a link to its parent, the links to its children as well as a set of genomic entities whose length is greater or equals that 'this.length'. It took about 3H00 to load 'snp130.txt.gz' and the size of the indexed BerkeleyDB/LocusTree database was 16Go (ouch!). The locus tree database was used to create (yet another) Genome Browser. My current implementation runs smoothly under Apache Tomcat. The SVG vectorial format was used to draw and hyperlink the data. Here is a screenshot of the first version I wrote one week ago. As you can see, the objects that were too small to be drawn, were displayed within a histogram. Later, I've added some labels. The browser is fast (sorry, I cannot show it at this time) but I need to play with the config of BerkeleyDB to speed up the insertions and reduce the size of the database. NB: The figures of this post were created using SVGToCanvas.